A local CBS affiliate is reporting that the driver of what looks like a 90's Ford Ranger "managed to walk away... with only minor injuries" after the truck dropped off an overpass onto a frozen lake near St. Paul, Minnesota. This is a good time to remind yourself that bridges can be frozen even when most roads have thawed, and of course slippery surfaces are especially treacherous to light pickups with nothing in the bed. There's also something to be said for the robustness of the ice up there. 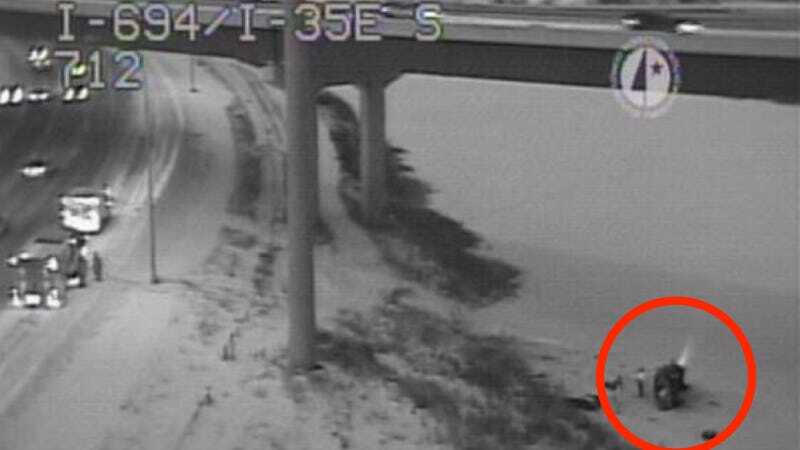 That overpass looks pretty high off the water, and from where the traffic camera's positioned the ice doesn't look dented.